Wow!! One of the more interesting and unique Panic setlists I've seen in quite a while. I can't wait to hear it on Panicstream. Not only were the covers great (Enter Sandman! ), but they also did two of my favorite original songs (Hatfield and Pilgrims). Like I said in an earlier post, the Panic Halloween shows are always stellar. Notes: * JB on mandolin. Ready for Charleston this weekend! I'm very excited to hear this. I'm planning on getting tickets for their Dec 30th show and I've been listening to the 12/31/06 show...man it's awesome! Never Miss a Panic Show PERIOD! LMAO - if you do find a pic please share it - LOL...too funny! listening to "This Part of Town" from 9.29.06 Charlotte. Heavily considering making a run from Charlotte to Charleston tomarrow night. getting scarce. Caught The Last Waltz Ensemble last saturday night- Excellant !!! I've been listening to alot of Widespread Panic too! Jimmy is such an awesome guitar player! Two more weeks until the Atlanta tickets go on sale. Whooo Hoooo!! I hope we do good and score seats near each other Heath! V from V for Vendetta (btw. 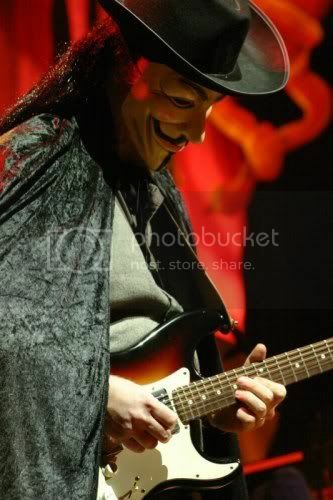 love that movie) holding a guitar is one step away from Buckethead. PS. The show is now up on Panicstream...i can't wait to hear it. That would be great Sue! I think I'm going to try for floor seats. i can finally PANIC this Sunday in Jacksonville. i'm going no matter WHAT. thanks for sharing the setlist, it is an interesting one! Linnie, you enjoy and yes Heath, I'm going to try for the floor too! Herring is one of the few axe men that can keep up with Buckethead. That show does look like a load of fun. The two Milwaukee shows a few weeks back were great as well, especailly the first night. It looks like I will be missing my first New Years eve shows in some time and because of that, I won't see WSP until next spring tour. Rumor is they will be going back to Nola for jazzfest which will be during a big spring tour in support of their new album.